Sayang Maha Mertha Beach welcomes you to Bali, the island of Gods. Sayang Maha Mertha Beach is located in the famous village of Legian, a pleasant 10 minutes drive from the airport, one minute walk (100 meters) from the world famous sunset beach of Kuta and about fifteen minute pleasant ride to Denpasar, the capital of Bali. With 60 rooms Sayang Maha Mertha Beach intends to give you a touch of local tradition to your visit. Our cottages are designed to reflect the traditional Balinese architecture, set among waving coconut palms in their natural landscape, and are attended by friendly and gentle Balinese who understand the purpose and meaning of your visit to this island. Sayang Maha Mertha Beach seeks to ensure you have memories which not only you wish to treasure, but also want to repeat. Sayang Maha Mertha Beach is small, peaceful, and serene. 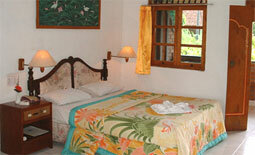 The rooms are equipped with air conditioning, hot and cold water. The Sayang Restaurant offers European, Chinese, Indonesian, and Balinese cuisine. Room service is until 11 o'clock at night. The swimming pool serves drinks and snacks from its sunken bar. Room with fan and cold water. Nearby Kuta Beach, in addition to being famous for its beautiful sunsets and as a worldwide surfing spot, it is perfect for fishing, canoeing, snorkeling, scuba diving, windsurfing, water-skiing, boating, parasailing, kiting, and even just for sitting around to enjoy the gentle sea breeze while watching all these activities. It is our wish to make Sayang Maha Mertha Beach a small paradise for you to enjoy while you're holidaying in Bali. Ask at reception about our Taxi service or make use of our Car or Motor Bike rental, or ask our staff about the many exciting and informative tours available.